Echo Managed Services have an excellent reputation in the UK water industry, but its new product Aptumo™ needed to make a splash worldwide. Aptumo™ is a piece of software which can be used globally by utility companies to manage their customer billing, built on the renowned and widely-used Salesforce platform. Its use of cloud technology ensures that it can be used by anyone, anywhere in the world. Aptumo™ is the first utility solution of its kind and Ultimate needed to make that distinction clear. Every job we undertake is built on our research-driven insight. For Aptumo™, we ran a two-part hands-on brand workshop. Firstly, we visited Echo Managed Services where we were fortunate enough to sit with the team working on the product and have them walk us through the solution’s capabilities and key benefits. This was later supplemented by our own desk research into the industry and Aptumo’s competitors. Following that session, we ran one of our famous Ultimate brand workshops to delve deeper into their values, motivation and goals. It was brilliant to see their passion first hand and learn how they view themselves as a company. Ultimately, we were left with a crystal clear understanding of who Aptumo™ are, what they want to achieve and who they want to target. With the launch of Aptumo™, Echo Managed Services want to be seen as the leaders in multi-utility billing.This is not to say however, that their pre-existing product RapidXtra is in anyway obsolete. Our branding for Aptumo™ needed to emphasise that this is a separate solution, not an evolution of RapidXtra. Echo is a registered Salesforce ISV partner, an integral part of the Aptumo™ solution, providing credibility, flexibility and adaptability. 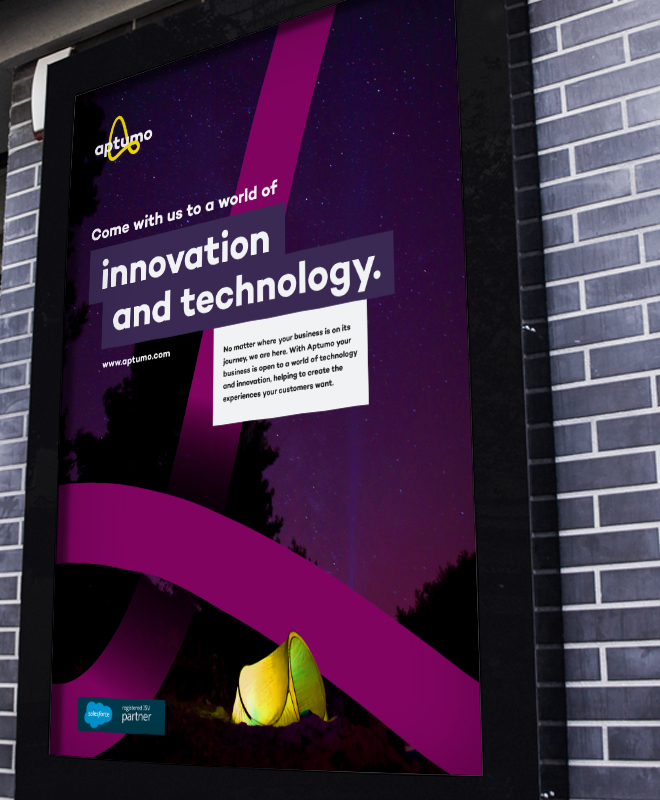 Our brand needed to leverage that relationship, informing customers of how Aptumo™ is native to Salesforce and the benefits that this brings for both them and their customers. Ultimately, the Aptumo™ brand needed to reflect the solution’s agility and ability to accommodate a business’ future growth. Echo want the audience to see Aptumo™ as being dynamic, reliable, flexible and having momentum. So what does Aptumo™ actually mean? Our winning name suggestion perfectly encompasses two of Aptumo’s core brand values: adaptable and momentum. ‘Aptum’ is Latin for ‘adaptable’ and highlights the flexibility of the solution and how it can easily integrate with utility companies large and small. Meanwhile, ‘momentum’ refers to the company’s incredible passion and desire to bring clients along on this journey. Aptumo™ fitted the brief of a single word that is memorable across multiple territories and languages and has an available .com URL. A key aspect of Aptumo™ is its aim to bring partners closer to their customers, forging better connections, encouraging more insightful conversations and building a greater sense of community. Our strapline of ‘This Way Forward’ reflects that. It underlines the forward thinking nature of the brand, whilst also acting as an invitation to join the Aptumo™ community. This sentiment is visualised in the Aptumo™ brandmark, which is itself adaptable and dynamic. It can be used in a multitude of different ways, whichever best fits the situation or image. 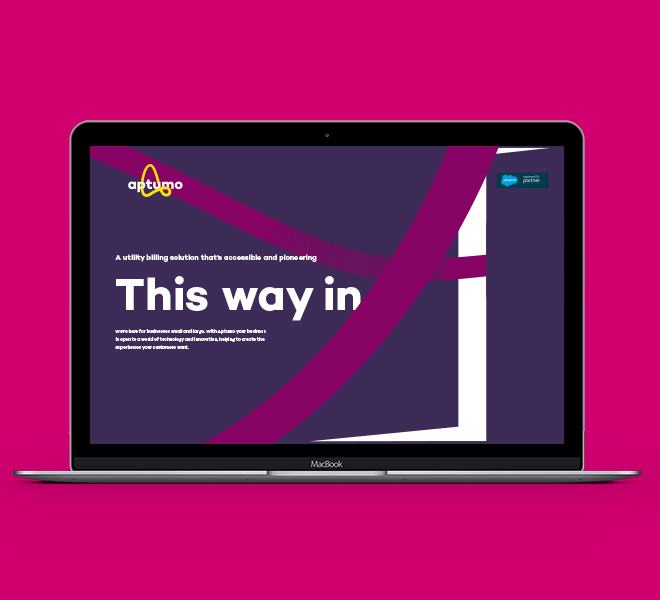 The distinctive curving yellow line winds its way through all our suggested photography, encapsulating the person within the image and demonstrating how the Aptumo platform will take users on a journey. As soon as the Aptumo directors saw our creative concept we knew we’d hit the nail on the head. They loved the brand and thought we’d ticked all the boxes on tone of voice, look and feel, colour palette and more. The brand has helped Echo to create a distinctive identity with Aptumo already securing their first client in Australia, a new and key target market.